In September, I will be having a solo art show at grace-gallery. The opening night will be Thursday, September 17th, at 7pm. 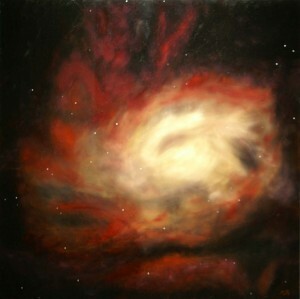 All my new paintings of galaxies and nebulae will be in the show, which will run until September 27th. As I paint these space objects, I can’t help but feel in awe of the mind-blowing magnitude of the universe. I hope that people will feel inspired to contemplate what it actually is that they are viewing a painting of. It’s interesting to realize that what can appear as a pin point of light in the night sky can actually be a galaxy or nebula! For example, the Circinus galaxy is visible in the southern sky with the aid of a small telescope. At thirteen million light years away, it is the closest known active galaxy to the Milky Way. I find it thrilling to paint this subject matter. My paintings are based on images taken by the Hubble Space Telescope. The Hubble images are created by layering three images taken at different light frequencies. Colour is added by giving each layer the colour red, green and blue. Applying colour in this way allows for more details to become visible to us. The Spaced Out exhibition at grace-gallery will be an interface between art and science, and our fascination with the wonders of deep space. ArtConverge is an online art magazine, distributed by Artistrun Media Society. Read the ArtConverge article at www.artistrun.org. Rachel Zottenberg, the Director of grace-gallery, is having The Shoe Show as part of the Olio Festival. She asked me to participate along with several other artists. 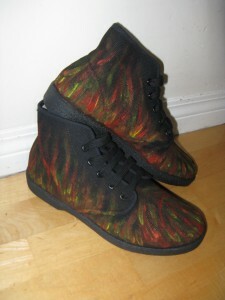 I selected a pair of shoes to paint…. I chose to paint sunspots on my shoes. Prototypical sunspots come in pairs with opposite magnetic polarity. Each shoe also shows a coronal loop, which is a magnetic flux fixed at both ends. Coronal loops are often found with sunspots at their footpoints. The Shoe Show is at grace-gallery, Friday August 14th, 8pm – 2am. The address is 1898 Main Street (at 3rd Avenue), Vancouver, BC. Please see www.grace-gallery.com for more details.